Imagine you are Godzilla. Imagine you're gorging yourself on humans, houses, and power lines, and having a high old time wrecking our feeble American and/or Japanese infrastructure. Now, imagine that your curiosity gets to you and you decide to find out what a Starbucks tastes like. Not a Starbucks coffee, but an entire Starbucks cafe. Everything in it. You just rip it out of its respective strip mall and pop it into your mouth. Whole. Now go buy some of this Dark Chocolate Espresso Trail Mix. Pop a handful in your mouth. Like a big handful. Tell me the two wouldn't be remarkably similar experiences. Now imagine you're an avid hiker. You're in the mountains and you're well-hydrated. You've got a decent amount of food, but your blood sugar's low. You brought everything you need, but you forgot to have your morning cup of coffee. But then you remember, you've got Archer Farms Dark Chocolate Espresso in your backpack. Tell me this stuff wouldn't hit the spot in a way that nothing else could. Tell me this wouldn't be like a sweet shot of caffeine, protein, and sugar right into your bloodstream. Tell me this wouldn't nail your craving to the wall like a bad tenant who just moved in to sublet your spare bedroom trying to hang an oversized, framed poster on the crumbling plaster and drywall. Dang. I'm good with metaphors. 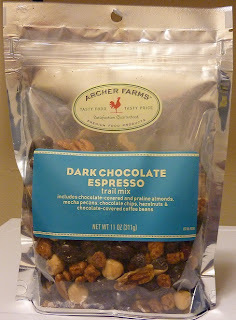 And this trail mix is good with hunger...and caffeine cravings. 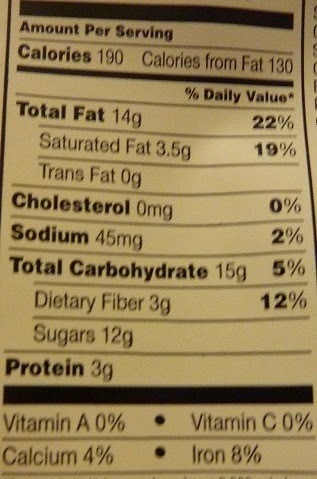 Tomorrow morning, I'm gonna skip my daily energy drink and wolf down half a bag of this stuff. It'll be my breakfast and energy drink in one. I'm diggin' it. And before this, I thought chocolate-covered espresso beans were overrated. 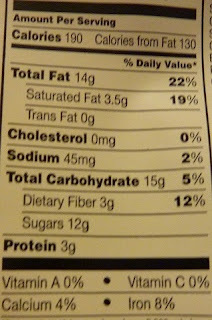 They were missing praline almonds, mocha pecans, and chocolate chips apparently. Friggin' awesome. Caffeine-hounds, dig in. Another winner. I give this item 8 out of 10 stars.